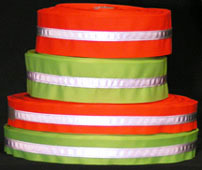 3M® SEW-ON REFLECTIVE FABRICS include both flame retardant reflective fabrics and fluorescent striped cloth trim (below). These are for coveralls, jumpsuits, jackets, coveralls and safety vests and are designed to provide maximum night-time conspicuity to vehicles and operating equipment. Standard 3M 8910 retains 66% of original reflectivity through a minimum of 50 140ºF wash cycles or 20 dry cleanings. 3M's flame resistant fabrics (8935 & 9587) meet NFPA standards for flame resistance and are for application to fire coats, bunker gear, coveralls, pants, and work gear worn by those who may be exposed to excessive heat, flame, or fire. 3M 8935 silver is industrial washable for up to 50 hot wash cycles (160ºF), or 30 dry cleanings. 3M 8987 fluorescent lime-yellow is home washable at 104ºF, and 9587 NFPA flame resistant silver striped lime-yellow fire coat trim is washable for 50 hot wash cycles (140ºF), or 30 dry cleanings. All will still retain 66% of their original reflectivity. Available in both 5-meter (16-ft) and 100-meter rolls below. If you order a multiple of short rolls and want them to be a continuous length, please request it in the "comment box" when checking out. Be sure to see the following 3M product links for specifications and cleaning stipulations (very bottom of link page): 3M 8906, 8910, 9910, 8935 & 8987 and 3M 9587. For flame resistant thread to sew down flame resistant trim, visit www.thethreadexchange.com. Note: it takes at least 4 meters of thread per meter of reflective trim, e.g., a 100-meter roll (110 yards) will require at least 440 yards of thread). e.g., a 100-meter roll (110 yards) will require at least 440 yards of thread). BELOW - SEW-ON COVERALL TRIM with REFLECTIVE STRIPE - consists of a durable 100% polyester fluorescent-colored grosgrain fabric 11 mils thick, with a 1/2-inch wide sewn-on stripe of 3M 8910 reflective fabric. Its overall thickness is 20 mils. Reflective coverall trim is soft and flexible and ideal for coveralls, jackets, pants, and work shirts worn by miners, trainmen, tow truck operators, heavy equipment operators, construction and utility workers; anyone for whom conspicuous visibility is critical to personal safety. It is home washable up to 50 cycles at warm temperature setting (105ºF) and low tumble dry, or up to 20 dry cleanings, and still retains 66% of its original reflectivity. Available in both 15-foot and 50-yard rolls.